How Did a Chinese-American Woman Become a Black Power Activist? Every once in a while, someone comes along who challenges your assumptions and forces you to rethink everything you thought you knew about history, culture and identity. 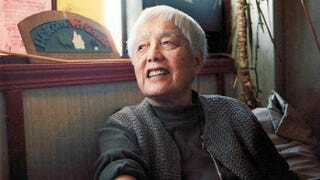 Take, for instance, Grace Lee Boggs. Before Martin Luther King Jr. and Malcolm X emerged as leaders in the civil rights movement, Boggs—a 99-year-old Detroit resident born to Chinese immigrant parents—was agitating on the frontlines of movements that presaged the events of the 1960s. She became an outspoken activist in the black power movement and was so connected to the struggle that the FBI mistakenly thought she was Afro-Chinese. A new documentary, American Revolutionary: The Evolution of Grace Lee Boggs, examines how a Chinese-American woman, raised in a middle-class family in New York City, evolved from a Marxist radical to become one of the leading activists in Detroit’s African-American community. It airs at 10 Monday night on PBS. The film’s director, Grace Lee (no relation), first met Boggs when she began working on her 2005 documentary, The Grace Lee Project, which examined the “model minority” stereotype of Asian Americans through the eyes of women who shared a common name. “I was so blown away by her existence in Detroit and the community around her, that I knew at the moment I had to make a longer film about her,” Lee told The Root. For Lee, Boggs’ story was an opportunity to examine Asian-American identity in the larger context of American history. So how did Boggs become a vocal activist in one of America’s largest black communities and what role did her identity play? “Had I not been born female and Chinese American, I would not have realized from early on that fundamental changes were necessary in our society,” Boggs wrote in her 1998 autobiography, Living for Change. The idea of evolution is a central theme of the film and a core tenet that inspired Boggs to action. She believes that you first have “to change yourself in order to change the world.” One of the early moments in her evolution happened in 1940 shortly after she earned a doctorate in philosophy from Bryn Mawr. Unable to find work at a time when businesses felt completely comfortable telling her, “We don’t hire Orientals,” the then-24-year-old headed to Chicago, where, for the first time, she witnessed African Americans engaged in social action—in this case, tenants fighting to end rat-infested housing. In 1941 she became involved in the March on Washington movement, which challenged the federal government to address discriminatory hiring practices in the defense industry. When President Franklin Roosevelt realized that organizers—led by A. Philip Randolph and Bayard Rustin—were serious about bringing thousands of people to the nation’s capital, he signed Executive Order 8802 banning discrimination at defense plants. Roosevelt temporarily halted the march—it would eventually happen in 1963—but in that moment, Boggs discovered her true calling. While in Chicago she met C.L.R. James, a West Indian Marxist involved in various socialist organizations that advocated for workers’ rights. By the 1950s, Boggs saw Detroit—with its booming auto industry attracting a steady stream of African Americans from the South—as the next front in a new workers’ revolution. It was there that she met her husband, James Boggs, an auto-plant worker from Alabama who was deeply involved in workers’ rights and a leading activist in Detroit’s black community. Through James, Grace was embraced by the city’s black community and together they became a formidable duo advocating for change for more than 40 years (he died in 1993). She would eventually leave the Marxist establishment to focus on the emerging civil rights movement. In 1963 she and her husband helped organize the march down Detroit’s Woodward Avenue, where Martin Luther King Jr. first tested the themes of his “I Have a Dream” speech, which he would deliver two months later in Washington, D.C. When the black movement splintered into two distinct camps—King’s nonviolent resistance on the one hand and Malcolm X’s militant radicalism on the other—Boggs chose the side that best aligned with her ideal vision of a revolutionary movement. With black people being brutalized and killed simply for speaking out, King’s stance on nonviolence seemed “naive” to Boggs. But like any good revolutionary, her views evolved over time. By the late ’60s, Boggs had become a well-known figure in the black power movement, after helping launch the all-black Freedom Now Party—a party that had no interest in integration but was interested in gaining political powers for African Americans. “Grace has made more contributions to the black struggle than most black people have,“ black power activist Angela Davis says in the film. Today, even though bankruptcy and high unemployment have left Detroit a crumbling, burned-out shell of its former self, Boggs is still evolving and pushing for revolution, though her activism these days primarily involves inviting people into her living room to discuss new ideas to help push the city in a different direction. Genetta M. Adams is a senior editor at The Root. Follow her on Twitter.